Hello. For some stranger reason, I realize that today’s earlier post, which celebrated this blog’s seventh anniversary, isn’t showing up on any of my RSS feeds. Don’t know why. And since I know a lot of you only follow my blog through the feed, please allow me to redirect you to this post, which is at least worth a few seconds of clicking and looking and appreciation of all the colors. 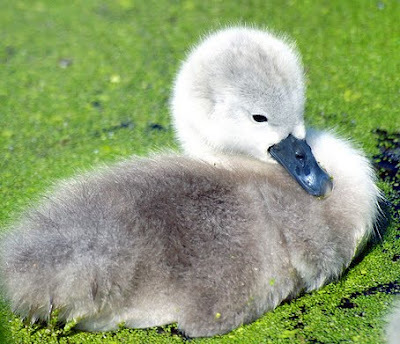 Also, for no reason because I don’t need one, here’s a picture of a baby swan. Please enjoy both post and swan. Agree that's excellent, anyway nice picture, good luck.